Isn’t love is letting go? Letting go of the country, sacrificing ourselves for the country. 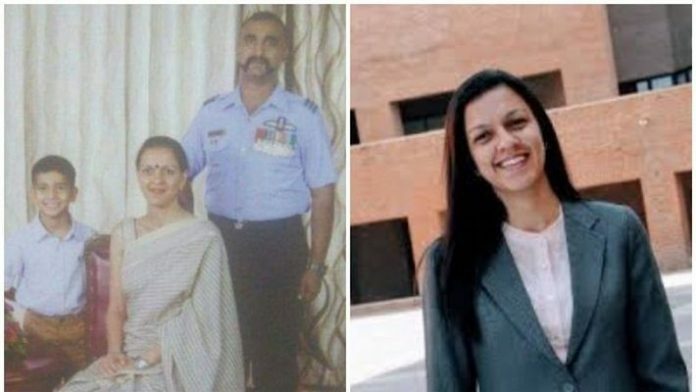 A brave soldier wing commander Tambaram ( India) Abhinandan Varthaman, who was captured in Pakistan after his MiG-21 bison crashed. He is a part of Indian Air Force’s 51 Squadron, called Sword Arms, based in Srinagar. He was born on June 21, 1983. Tanvi Marwaha, she serves as the Squadron Leader in the Air Force for 15 years. Tanvi holds the Armed Force Executive Degree from IIM, Ahmedabad. Ms. Marwaha is working in the Reliance Jio, Bengaluru as the DGM. The dream come true for most of the people when they get married to their childhood love. And that’s the same with our superhero who served the nation with his bravery and had a very simple love story with Tanvi Marwaha. They know each other from childhood class 5th. It is also observed that they pursue their college degree together in microbiology. After completing their college they talked to their family about their love. And in the end, they got knotted with each other for life. Both never knew that their friendship will turn out to be in such a deep love and then into marriage. They have loved each other and serve their country (India). Eventually, We all look for such a love story. This story doesn’t have any twists or tragic but is the simple and decent love story of two brave soldiers. Sometimes love doesn’t require big twists and turns, it’s just simple and sweet. That’s the nature of love: innocence. The love that begins was everlasting.